Diagnostic microscope slides have wells created with an extremely hydrophobic coating of Teflon™ having a contact angle greater than 150° with distilled water. The printed ink thickness is approximately 20-30 um. 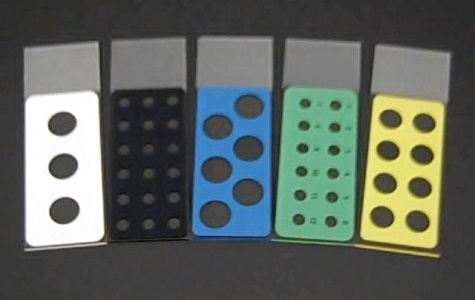 The diagnostic microscope slides may be used with immunohistochemical (IHC) techniques, immunofluorescence (IFA) and immunolabelling with histological sections or cellular cultures. The slides can be sterilized with acetone, methanol, ethanol or any combination and the hydrophobicity will return to its full strength once the solvent has boiled off the surface. The diagnostic slides resist enzymatic treatments and microwaves. The production of the diagnostic slides are completely automated from beginning to packaging eliminating dirt, dust, flaws and breakage. Our diagnostic slides have 90° corners and ground edges and are sold by the gross of 144 slides with each gross consisting of 2 boxes of 72 slides. Tekdon offers single well slides all the way up to 192 well slides. We can also make customized microscope slides based on your specific well formation, diameter and location.